What Is A Hot Prowl? You have heard it on the news and read about it in the paper, but what exactly is a "Hot Prowl?" A "Hot Prowl" is a burglary when a subject enters, or attempts to enter your home while someone is home. A hot prowl burglary is dangerous because of the possible confrontation between the subject and victim. A victim has a number of options to choose from if they feel someone is attempting to break into their home, or if they feel someone is in their home. Call 9-1-1 immediately. If you can't speak to the dispatcher, leave the phone off the hook—don't hang up. The dispatcher will send officers out to your location. If you can speak to the dispatcher, tell him/her what you hear, where it is coming from, how many people live in the house, etc. If you see the subject, give a description to the dispatcher. This information will be relayed to officers responding to the scene. If you feel someone is in the house, and you can leave safely, do so. 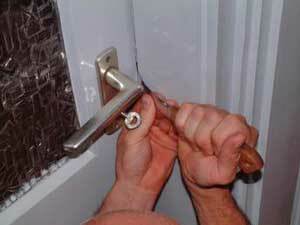 If you and other members of your family can not leave safely, try and lock yourselves in a bedroom or bathroom. Take the phone with you if possible. Be safe. Try and avoid a confrontation with the subject if at all possible. Remember the following home security tips when leaving your home or going to sleep. Make sure all windows are closed and locked. For extra security, add a sliding window lock to each window, place a dowel or stick in the window track. To prevent the window from being forced out of the frame, install a flat-headed metal screw into the top of the window frame, two inches from each window frame edge. Be sure all doors are closed and secured. All exterior doors should have deadbolts installed, including the door that leads from the house into the garage and from the garage to the outside. All patio doors should be closed and secured. For extra security, install patio door pins or patio door locks, and to prevent the door from being lifted out of its frame, install a flat-headed metal screw into the top of the patio door frame, two inches from each edge and one in the middle. Install motion sensor lights to areas around your home that are dark. For extra security, install motion sensor lights near the front door, the back door and above the garage. Form a Neighborhood Watch group in your neighborhood or community. Get to know your neighbors. Communicate with each other and the police department about suspicious activity or if you are a victim of a crime. For more information about forming a Neighborhood Watch group in your community, call the Crime Prevention Unit at 760-839-4425.